Coarse pitch, fine pitch, and rougher finisher are all multi-flute designed for fast material removal. 3 flute design for aluminum applications also available. Immediate availability from our large inventory. Complete size ranges from 3/16"-2". Special sizes available on request. Backed by the support of our talented professional in this domain, we have been able to bring forward a qualitative range of Rough End Mill. - Used in milling machines or machining centers. Our organization is a prominent manufacturer and supplier of Roughing End Mills. These products are very useful for rough machining because of their excellent performance, cutting capacity, dimensional accuracy and corrosion resistance. Our range of Roughing End Mills is three time much efficient than conventional cutters. - Solid Carbide End Mill and Ball End Mills For Stainless Steel, Titanium & High Temperature Alloys. Being a client centric firm, we offer premium quality Rougher End Mill to our patron that is developed using latest production techniques and top class material. Owing to the rich industrial experience and expertise in this domain providing quality assured assortment of Roughing End Mill. 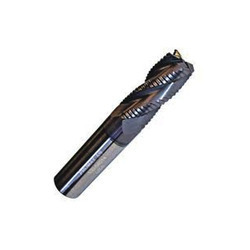 This Roughing End Mill is available in varied specifications and sizes according to the demands of customers. Our product range is widely demanded in different engineering industries.